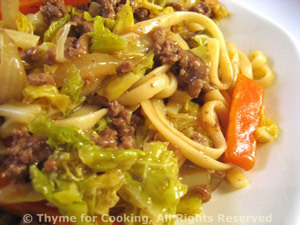 Ground Beef and Savoy Cabbage Lo Mein, Thyme for Cooking easy stir-fry. Heat olive oil in large nonstick skillet over medium-high heat. Add onion and carrot to skillet; stir-fry for 2 minutes.